Preheat the barbecue for indirect cooking. Place chicken wings in a plastic bag with the rice flour, salt and pepper. Shake until well coated. Once the barbecue is preheated, turn the centre burner off and leave the outside burners on high. Shake the excess flour off the chicken wings and place them in the centre of the barbecue, ensuring a small gap is left between each piece so the heat can circulate evenly around them. Close the lid and roast the wings for 30 to 35 minutes or until cooked through. There is no need to turn them during the cooking time. While the wings are cooking, mix all the blue cheese sauce ingredients together in a small bowl. Microwave briefly until just warmed through. Five minutes before the wings are cooked, combine the hot sauce ingredients in a small saucepan. Heat the hot sauce on the side burner (or stove top) over low heat. Cook until butter has completely melted and the sauce has just started to bubble gently. 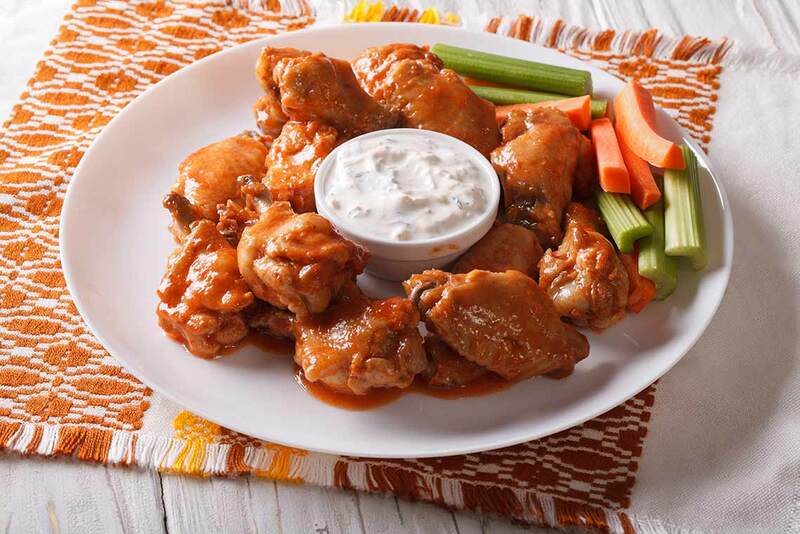 Once the wings are cooked, coat in the hot sauce and serve immediately with the blue cheese sauce and celery sticks.